The city of Trumann recently recieved a grant through East Arkansas Planning and Development District to purchase equipment for the city's recyling program. 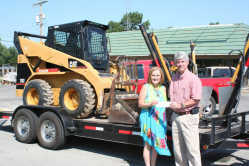 The $22,900 grant went toward the purchase of a Bobcat with heated and air-conditioned cab, multiple accessories, and a trailer to haul it. Mayor Sheila Walters said the city applied for the grant in 2010 and it is just now being processed. The grant is part of a statewide program to promote recycling. "Trumann runs a great program," said Dennis Burks of East Arkansas Planning and Development District. "This will help them run it better." "We're filing for a 2012 grant to help out recycling even more," Mayor Walters said.